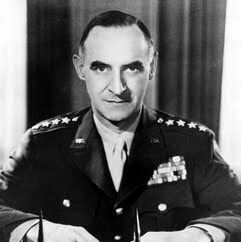 General Lucius Dubignon Clay was an American officer and military governor of the United States Army known for his administration of occupied Germany after World War II. Clay was deputy to General Dwight D. Eisenhower, 1945; deputy military governor, Germany 1946; commander in chief, U.S. Forces in Europe and military governor of the U.S. Zone, Germany, 1947–49. He retired in 1949. Clay orchestrated the Berlin Airlift when the USSR blockaded West Berlin.